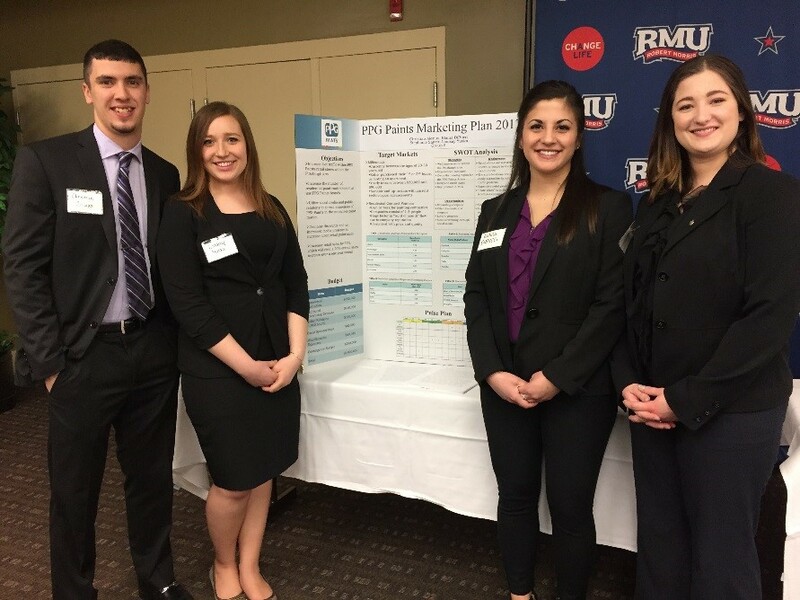 The 4th Annual AMA Pittsburgh Collegiate Marketing Competition took on PPG Paints and brought it all to Robert Morris University on April 7th. 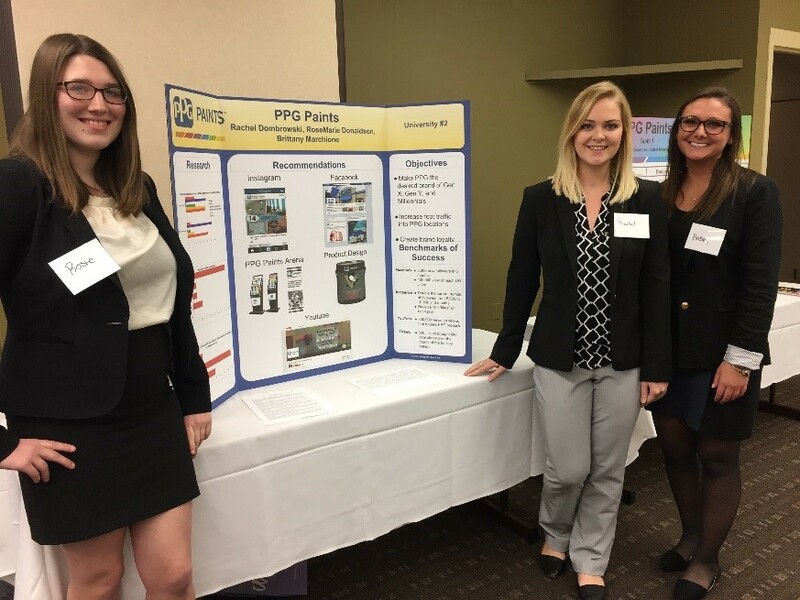 The PPG Paint connection was spearheaded by Zone HR Manager Kristen J. Canale and Jeff Black, Zone Director US Stores working with Dr. Jeananne “Nan” Nicholls of Slippery Rock University who wrote the case for the competition. 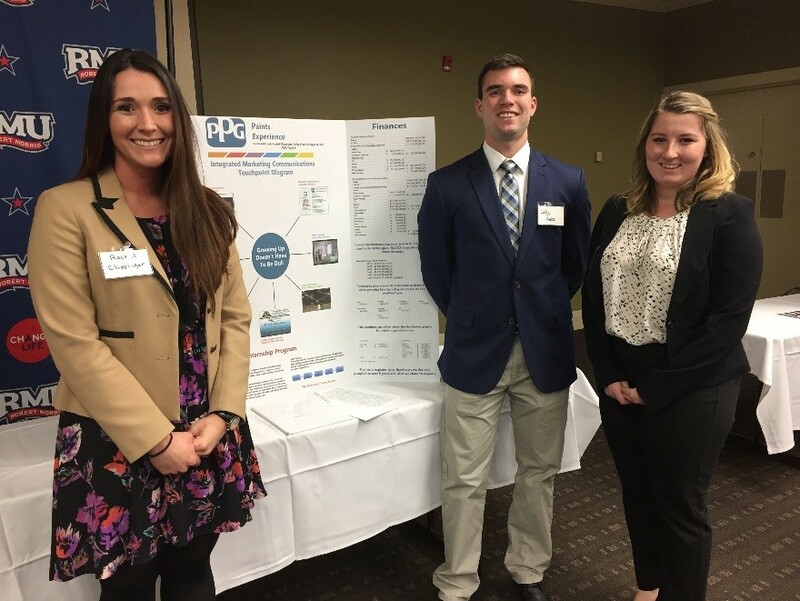 This year’s competition featured 15 teams of undergraduate marketing and business majors from Chatham University, Indiana University of Pennsylvania, University of Pittsburgh, University of Mount Union, Messiah College, Robert Morris University, Slippery Rock University and West Virginia University. Eleven judges worked on the three phases of the competition. Phase 1 included the marketing plan. 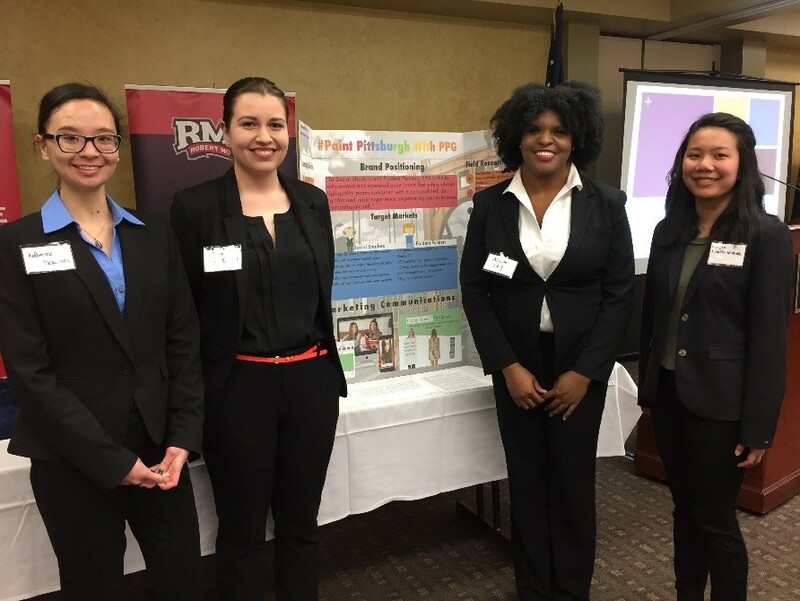 Phase 2 and Phase 3 were onsite at RMU and included Q&A with the teams and their posters as well as the presentations of the top five teams. Thanks to Paul Carbone Sales and Marketing Director UPMC Health Plan, Michelle Fuscaldo Management Supervisor MARC USA, Josh Gmys President Pittsburgh American Marketing Association, Steven Sarfin VP Marketing at MedExpress, Shawn Graham Founder Deep Varnish, Shea Murtaugh President Hoffman Murtaugh, Beth Vukmir VP Strategy Director for The Gatesman Agency, Donna Evans PR Consultant, Pam Koren Marketing Director McDonalds, Joe Leachko StudioMe and Angela Churchill Director of Marketing Comcast Business for their time and expertise. Special thanks to the AMA Higher Education committee. Co-Vice Presidents Paige Beal Point Park University and Deb DeLong Chatham University work with a committee of faculty including Mike Walsh WVU, Steve Clinton RMU, Nan Nicholls SRU, Joel Evans University of Mount Union, David Hagenbuch Messiah College, Parimal Bagthat IUP and Audrey Guskey Duquesne University to develop and implement the competition. 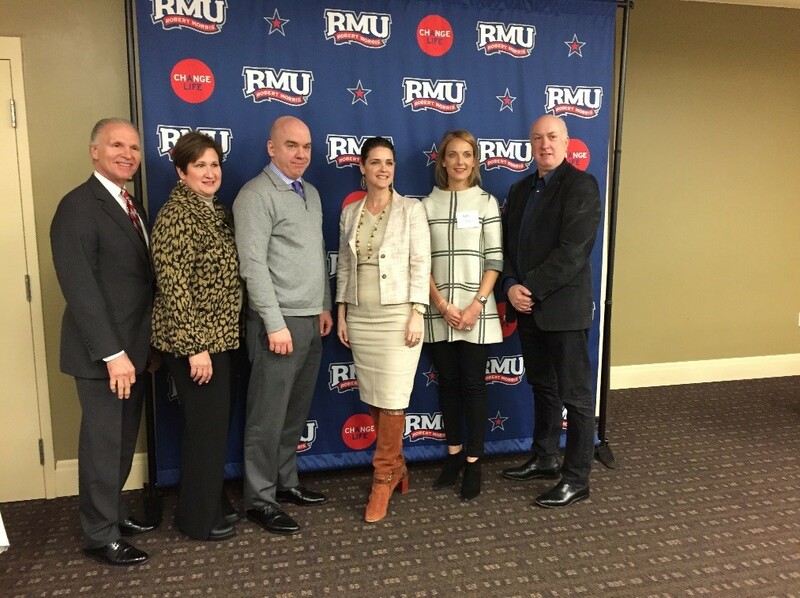 Judges on site included (left to right) Paul Carbone – UPMC, Donna Evans – PR Consultant, Shawn Graham – Deep Varnish, Shea Hoffman – Hoffman Murtaugh, Beth Vukmir – The Gatesman Agency, Steven Sarfin – MedExpress and Michelle Fuscaldo – MARCUSA (not pictured). 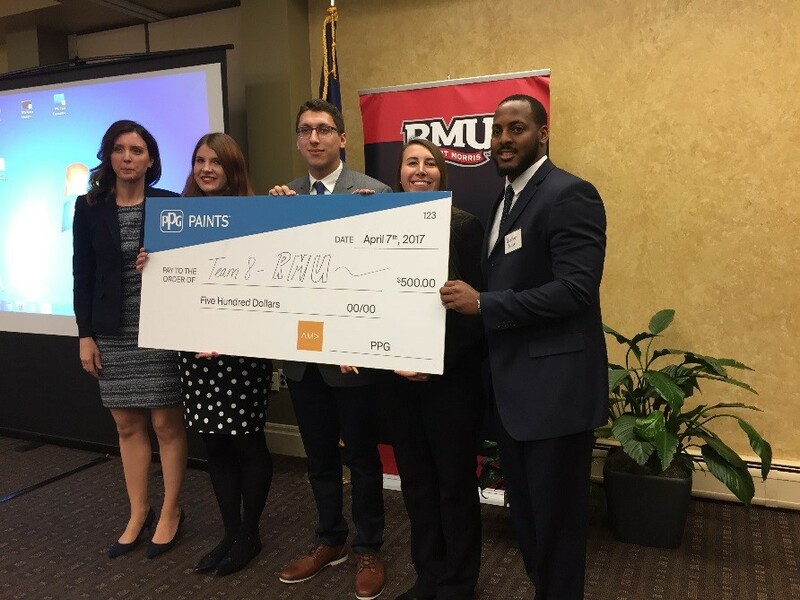 Kristen Canale Zone HR Manager PPG Paints presents the check to the winning team from Robert Morris University, comprised of Jess Snyder, David Bursic, Natalie Roche, and Quaheem Brown. Indiana University of Pennsylvania’s second place team comprised of Rachel Clippinger, Colby Krahe and Nicole McCourt. Chatham University’s third place team comprised of Katherine Sclabassi, Elina Lankinen, Alice Shy and Morgan Schultz-McArdle. Slippery Rock University’s fourth place team comprised of Christian Aleasius, Lindsay Yuska, Elaina DiBucci and Stephanie Sarver. West Virginia University’s fifth place team comprised of RoseMarie Donaldson, Rachel Dombrowski and Brittany Marchionne.